For the eighth time in a span of 16 seasons, the New Palestine Dragons are in the IHSAA State Finals. This weekend, they’ll seek their second consecutive state title and fifth overall as they face South Bend St. Joseph for the 3A title. Seniors Mackenzie Jones, Rieley Widmann and Ashley Prange will be looking to lead the Dragons to their second straight state title Saturday. NP has advanced with an impressive run through the tournament, beating its five foes by a combined score of 65-2, including wins of 8-0 over Tri-West and 12-1 over Corydon in the Jasper semistate. The Dragons meet at South Bend St. Joseph team that has shut out five of its six tournament foes. In the semistate, the Dragons wasted little time getting going. A four-run second inning paved the way for an 8-0 win over Tri-West. Mackenzie Jones pitched a three-hit shutout. Emily O’Connor was 3-for-3 with a double and Ashley Prange had two hits and two RBI. The Dragons then posted a 12-1 victory over Corydon in the semistate championship game. NP scored in all six innings, starting with a three-run first. The game was keyed by Macy Miller’s fourth-inning grand slam. She had five RBI on the day. Prange also homered, her 17th of the year, and drove in three runs. She has a state-record 70 RBI for the season. Jones and Kaylea Bullock combined for five Ks in the contest. They have combined for a 0.48 tourney ERA. Prange is hitting .667 with two homers and eight RBI in the tourney. O’Connor is hitting .600 with 11 RBI. Michaela Jones is hitting .800 with eight RBI. Miller is hitting .583 with eight RBI. Senior Ashley Prange was named the Gatorade Player of the Year for Indiana softball Monday. She holds several state records – career HR (46), single-season HR (21, set in 2017) and single-season RBI (70). She also is two RBI away from tying the state career mark of 182. She is second in the state in home runs (17), third in hits (62), ninth in runs (50) and 18th in batting average (.596). As a team, the Dragons rank third in the state with a .451 batting average and second with 385 runs. NP leads the state with a record 69 homers, 23 more than Pioneer (46). In addition to Prange’s rankings, Michaela Jones is 36th in batting average (.556). Jaylin Calvert is second in the state in scoring (58). 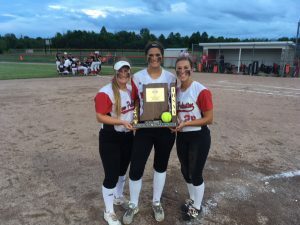 NPHS has the second-most state titles in Indiana softball history. Only Center Grove (6) has more. Ed Marcum has coached all four champs. A victory in Saturday’s game would tie Marcum with Center Grove’s Russ Milligan for the state record with five state titles. NP is 384-59 in 15 seasons under Marcum. Earlier this season, the Dragons won their fifth straight Hoosier Heritage Conference title and ninth overall. They also won their 13th sectional and ninth regional. NP teams have also won sectional championships in volleyball, girls golf, girls soccer, boys tennis and girls basketball this season. NPHS also won HHC titles in girls golf, boys tennis, football, girls track and baseball. The Dragons are seeking the seventh team state title in school history. In addition to the four softball titlists, NP won state titles in 3A baseball (2004) and 4A football (2014).